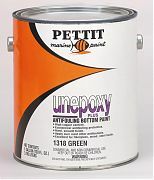 Unepoxy Plus is a modified epoxy that dries to a hard finish able to withstand season-long use and abuse. It has excellent adhesion to fiberglass, wood and properly primed steel hulls and is compatible over most previously applied bottom paints. Compared to other traditional modified epoxy antifoulants, Unepoxy Plus has more copper for the dollar making it the right choice for the value conscious boat owner.